From 1940, and for every subsequent year of the war, there was a national drive to get the population to save their money. People could buy war bonds or put their money into other savings schemes, with the aim of putting more cash into the hands of the government rather than individuals or businesses. The government would then spend the money on the war effort. Each year had a different focus and schemes were based locally, often leading to neighbouring towns competing as to who would pledge the most savings. For Brandon in 1941, it was all about ‘War Weapons Week’, saving the equivalent amount of money to buy three Spitfires for the Royal Air Force. For the Brandon district (including Elveden, Lakenheath and Santon Downham) this meant £15,000, which was surpassed in the first week. Below are a few details of how it went. MARCH 1941 – The War Weapons Week target for Brandon and District has been set at £15,000 (Brandon £10,000 and Lakenheath & Elveden £5,000) and this target has already been exceeded with £22,289 being raised in the first week. Mr Herbert Edwards, Head A.R.P. Warden, is holding a daily exhibition of captured German war relics on the Market Hill. The exhibition includes a dinghy, paddles, a Mae West coat, a fin and rudder from a Junkers 88, parachute flares, machine guns, Very lights, incendiary bombs and a land mine. The War Weapons Week Committee Room is in the Gas Company showroom, High Street, where Mr T.A. Green is the Secretary and the showroom is displaying German bombs in their windows. Brandon shopkeeper, Mrs M.E. Green, has a photograph of Sgt Edmund George Caban (R.A.F.) in her shop window. He has recently been awarded the Distinguished Flying Medal. Grand Parade of Military, R.A.F., and Civil Defence Services, with representatives of every organisation. Military Bands in attendance, starting from Brandon Railway Station at 2 p.m. and terminating on Market Hill (or, if wet, in the Cinema), with short religious service conducted by Rev. J. D. Crawford (R.A.F. Chaplain) and the Rev. H. Tyrell Green. 7 p.m. – Military Band Concert in Cinema, admission Free. Silver collection. Market Hill, Brandon. – Daylight Cinema Shows afternoon and evening. Military Band, 6.30p.m. to 7.45 p.m.
Market Hill, Brandon. – Daylight Cinema Shows during afternoon. 7 p.m. – Grand Whist Drive, Paget Hall, admission 1s. Valuable prizes. Lakenheath. – 6.30, Grand Parade of Civil Defence Services, Military Band. Daylight Cinema Shows and address by National Savings Committee Representative. Market Hill, Brandon. – Afternoon Cinema Show. 6.30 p.m. – Grand Display of A.R.P. Exercises on Station Meadow. All local A.R.P. organisations will take part, including Brandon Fire Brigade and A.F.S., under Capt. B. Olley, and with kind co-operation of Military and R.A.F. Units. Gas masks must be carried between 6.30 and 8 p.m. in Brandon. 8 p.m. – Popular Dance, Paget Hall, admission is 6d., H.M. Forces half price. Elveden. – 6 p.m., Band Concert Military Band, Cottage Home Green. 7.45 p.m. Daylight Cinema Show. 6.30 to 7.45 p.m., music by Military Band, Market Hill. Weeting Hall. – 7.30 p.m., “War Weapons” Bridge Drive. Admission by ticket only, price 3s. 6d. Lakenheath. – Grand Variety Concert in Village Hall, arrranged by the Home Guard. Brandon. – Daylight Cinema Shows. 8 p.m. to 1 a.m. – Paget Hall, Grand Dance R.A.F. Dance orchestra; admission 5s, including light refreshments. Lakenheath. – 7 p.m., Observer Corps Dance, Village Hall. M.C. Mr. R. Bacon. Competitions, Prizes. Admission 1s. Market Hill, Brandon. – Display of Equipment, Military and Fire Brigades, Daylight Cinema Van, Music by Military Band, 3 p.m. to 4.30 p.m., and 6.30p.m. to 7.30 p.m.
7.30 p.m. -War Weapons Dance. Weeting Hall (Military Band). Admission by ticket only, 1s 6d, to be obtained at War Weapons Week Centre (Gas Company Show Rooms), Brandon. 7.30 p.m. – All Star Variety Concert, Church Institute; plan of seats at Mrs. M. E. Green’s, High Street. Admission 2s 4d, 1s 9d and 1s 2d. 1 – 2 – 3, Complete the “Hat Trick” In Spitfires. S. & P. LINGWOOD, Hatter’s Furriers, Brandon. BRANDON’S BONDS TO BUILD BRANDON’S SPITFIRES. A. J. GASCOYNE, Grocer and Draper, 5, Thetford Road, Brandon. Give The Service – THE TOOLS – and THEY WILL FINISH THE JOB. MRS. M. E. GREEN, Newsagent, High Street, Brandon. EVERY LITTLE HELPS TO WIN. HERBERT EDWARDS, “The Flint Knappers”, Brandon. MEAT IS RATIONED BUT NOT YOUR SAVINGS. F. W. GENTLE & SON, LTD., Butchers & Farmers, 33, High Street, Brandon. £. S. D. SPELLS SPITFIRES. MOSS & POTTER, Wine Merchants, Thetford & Brandon. WE/LLES, WILL/KIE, WIN/ANT. AVENUE CINEMA, Brandon. NO NEED TO WHITEWASH OUR AIMS.F. J. MOUNT & SON, Ltd., Lime & Whiting Manufacturers, Brandon. MAKE YOUR MONEY FIGHT. J. W. NORTON,Timber Merchant, Brandon, Elveden and Mildenhall. W. ROUGHT, Ltd., Hatters Furriers, Brandon. There was a ¾ mile parade, starting at the Ram Meadow, visiting High Street, Thetford Road, George Street, London Road, Town Street, and finishing on the Market Hill. The parade featured two military bands, the Home Guard (under the leadership of Company Commander Wentworth-Smith, and Platoon Commanders Mr B.W. Wood and Mr W.G. Gentle), the Brandon Volunteer Fire Brigade, the Auxiliary Fire Brigade (Led by Captain B Olley), Air Raid Precautions and First Aid (led by Mr H Edwards), Brandon ARP Organiser (Mr R.J. Woodrow), Special Police Constables (led by Mr F.J. Mount), Police Sub-Divisional Commander (Mr A.J. Gascoigne), Police Section Leader (Sergeant J.A. Adams), 1st Company Brandon Girl Guides (led by Captain E Murrell), a contingent of troops, Chairman and Secretary of Brandon’s War Weapons Week Committee (Mr H Lingwood and Mr T.A. Green), and at the end of the parade was a selection of guns, tanks, Army motor vehicles, the Brandon Fire Engine, Tenders and Ambulance. Music was provided at the Market Hill. Also at the Market Hill the chaplain of the R.A.F., the Rev J.D. 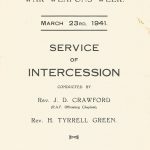 Crawford and the Rev H Tyrell Green provided a Service, where two hymns were sung, “Eternal Father Strong To Save” and “Abide With Me”. Then followed the Lord’s Prayer, a lesson and a blessing. All this was relayed by loud speakers to the crowd on the Market Hill. The parade then returned to the Railway Meadow. The Avenue Cinema held a military band concert that was conducted by Mr W.R. Turner. The Paget Hall was decorated for a whist drive with 23 playing tables. The was an Air Raid Precautions exercise where the wardens demonstrated the rights and wrongs of extinguishing incendiary bombs by using stirrup pumps and buckets of sand. To simulate a gas attack tear gas was released and all who attended donned their gas masks and the First Aid were present to help deal with anyone who suffered inhalation of smoke or gas. A variety concert was held at Lakenheath, while Weeting Hall hosted bridge games. A late night dance, 8pm to 1am, was held at the Paget Hall. There was a display of military and Fire Brigade equipment on the Market Hill and a military band played music there in the afternoon and evening. At 7.30pm, at the Church Institute, there was an ‘all-star’ variety concert. 18 other children were also awarded prizes. After the War Weapons Week had finished all the money the residents had pledged to save was added up, giving a grand total of £52,356, which equates to £13 per head (Brandon, Lakenheath, Elveden, Weeting, Santon Downham). This sum also includes 13s 8d from the 300 school children at the Brandon Elementary School who invested their money in Government Savings. Money could be saved through the following schemes – Savings Bonds, War Bonds, Defence Bonds and Saving Certificates. Mr A.J. Harris (Assistant Commissioner for National Savings) asked to place on record the intense gratitude of his headquarters for the wonderful response.